As I have grown (and continue to grow) in the favor and knowledge of the Rabbi Yahvshua the Mashiyach (2 Kepha 3:18), I want to explain how I understand YaHVeH`s favor on us through HIS Ben Yahvshua. I believe it is important for us, the body of Yahvshua to understand this crucial attribute of YaHVeH`s love toward us (Romans 5:8). I feel I need to explain this because I am attacked some times by Christian with this phrase “we are under grace” (except “grace” is the English transliteration of a Greco-Roman idol), and I couldn’t agree more. But my understanding of YaHVeH`s favor and Christianities (Rev. 13:11) understanding in “many” (Mat. 24:5) cases are two different doctrines. Luke 23:39: and one of the male factors, which were hanged railed on Him, saying, if You be Mashiyach, save Yourself and us. 40. But the other answering rebuked him, saying, do not you fear Elohiym, seeing you are in the same judgment? 41. And we indeed justly; for we receive the due reward of our deeds: but this Man/Iysh has done nothing amiss. 42. And he said to Yahvshua, Rabbi, remember me when You come into Your kingdom. 43. And Yahvshua said to him, Truly I say to you, Today you shall be with Me in paradise. Mattith`Yah: 20:1: For the kingdom of Shamayim is comparable to a Man that is a householder, which went out early in the morning to hire laborers into His vineyard. Mattith`Yah: 20:2: And when He had agreed with the laborers for a penny a day, He sent them into His vineyard. 4. And said to them; go all of you also into the vineyard, and whatsoever is right I will give you. And they went their way. 6. And about the eleventh hour He went out, and found others standing idle, and said to them, why stand you all here all the day idle? 7. They say to Him, because no man has hired us. He said to them, Go all of you also into the vineyard; and whatsoever is right, that shall you all receive. 8. So when even was come, the Rab of the vineyard said to His steward, call the laborers, and give them their hire, beginning from the last to the first. 12. Saying, These last have wrought but one hour, and You have made them equal to us, which have borne the burden and heat of the day. 13. But He answered one of them, and said, Friend, I do you no wrong: did not you agree with Me for a penny? 14. Take what is yours, and go your way: I will give to this last, even as to you. 15. Is it not lawful/Torah for Me to do what I will with My Own? Is your eye evil, because I am right? 16. So the last shall be first and the first last: for many are called, but few chosen. 1. The stages or time frame of foretelling/nebuah being fulfilled. When Yahvshua first came in the flesh (Mattith`Yah 20:1-2, 8, 12). 2. The middle time frame (Mattith`Yah 20:3 – 5, 10 – 12). 3. The time frame of when the hour is near for His return (Mattith`Yah 20: 6 –7, 8, 9). 1. The state we are in when we are first called (Mattith`Yah 20: 6 –7, 8, 12). 2. 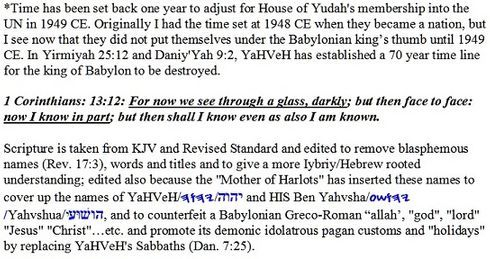 The state we are in when our knowledge increases of Yahvshua and His message (Mattith`Yah 20:3 – 5, 10 – 12). 3. The state (fruit) we are in when He returns (Mattith`Yah 20:1-2, 8, 9). I trust I was able to convey my point by this example. YaHVeH`s favor is always on us if we continue in our walk with Yahvshua the Mashiyach (Romans 2:7; Galatians 6:9). Yahvshua does have certain expectations on us as we grow in the favor and knowledge of Him (Mattith'Yah/Matthew 24: 42 – 51). This understanding is made even clearer in the parable found in Mattith`Yah chapter 25. YaHVeH knows our abilities, intelligence level and material resources, with that HE has given us all some type of gift (talent) to use for HIS splendor, and HE expects us to us2 it. I really didn’t understand what gift YaHVeH has given me until about seventeen years ago (as of the time of this update). Mattith`Yah/Matthew: 25:14: For the kingdom of Shamayim is as a Man traveling into a far country, who called His own servants, and delivered to them His possessions. 15. And to one He gave five talents, to another two, and to another one; to every man according to his several ability; and straightway took His journey. 17. And likewise he that had received two, he also gained another two. 18. But he that had received one went and dug into the earth, and hid his Rab's money. 19. After a long time the Rab of those servants returned, and reckoned with them. 20. And so he that had received five talents came and brought other five talents, saying, Rabbi, You delivered to me five talents: observe, I have gained beside them five talents more. 21. His Rab said to him, Well done, you righteous and trustworthy servant: you have been trustworthy over a few things, I will make you ruler over many things: enter you into the joy of your Rab. 22. He also that had received two talents came and said, Rabbi, You delivered to me two talents: observe, I have gained two other talents beside them. Mattith`Yah: 25:23: His Rab said to him, Well done, righteous and trustworthy servant; you have been trustworthy over a few things, I will make you ruler over many things: enter you into the joy of your Rab. 25. And I was afraid, and went and hid Your talent in the earth: look, here You have what is Yours. 27. You ought therefore to have put My money to the exchangers, and then at My coming I should have received My Own with usury/interest. 28. Take therefore the talent from him, and give it to him, which has ten talents. 29. Because to every one that has shall be given and he shall have abundance: but from him that has not shall be taken away even that which he has. 30. And cast you the unprofitable servant into outer darkness: there shall be weeping and gnashing of teeth. 36. Naked, and you all clothed Me: I was sick, and you all visited Me: I was in prison, and you all came to Me. 37. Then shall the righteous answer Him, saying, Rabbi, when did we see You hungry, and fed You? Or thirsty, and gave You drink? 38. When did we see you a stranger, and took You in? Or naked, and clothed You? 39. Or when did we see You sick, or in prison, and came to You? 40. And the Melek shall answer and say to them, Truly I say to you, Inasmuch as you all have done it to one of the least of these My brethren, you all have done it to Me. 43. I was a stranger, and you all took Me not in: naked, and you all clothed Me not: sick, and in prison, and you all visited Me not. 44. Then shall they also answer Him, saying, "Lord", when did we see You hungry, or thirsty, or a stranger, or naked, or sick, or in prison, and did not minister to You? 45. Then shall He answer them, saying, Truly I say to you, Inasmuch as you all did it not to one of the least of these, you all did it not to Me. Yahudah/Jude 1:4: For there are certain men crept in unawares, who were before of old ordained to this judgment, wicked /unrighteous men, turning the favor of our Elohiym into lasciviousness, and denying the only EL YaHVeH, and our Rabbi Yahvshua Mashiyach. I have and continue to see YaHVeH`s favor on me. I am a sinner (Romans 3:23), but now that I believe in Yahvshua the Messi`Yah and have repented from sin, I don’t set my heart on sinning. That means I don’t deliberately set out to sin (Shemoth/Exodus 20) as I did before I was called. Before I was called I would make it a point in my life to sin (1 Yahn 3:4), I DIDN’T CARE (Romans 8:7; Galatians 5:19 – 21)! No, and I don’t go around boasting of how well I keep the Law/Torah either (Shemoth 20; Romans 3:20, 24, 28), it would be foolish to do so (Galatians 6:1). But I do boast in Yahvshua (Yirmi'Yah/Jer. 3:6; Romans 3:22) now that YaHVeH through HIS Ben has written that Torah (Shemoth 20; 1 Melekiym 8:9) on my heart (Yirmi'Yah 31:33; Iybriyiym 8:10).